Affection turns to obsession—and love means both devastation and redemption in this gripping novel from the author of I Heart You, You Haunt Me. Rae’s always dreamed of dating a guy like Nathan. He’s nothing like her abusive stepfather, in other words, he’s sweet. But the closer they get, the more Nathan wants of her time, of her love, of her… And the less she wants to give. Rae is a sweet, kind and caring girl from the lower working class part of her little town, a seventeen year old high school student who writes poetry to deal with her life. No one can ever know how life is at her house, with her neglectful doormat mother and abusive and domineering step father. Rae strikes up a whirlwind romance with Nathan, her first boyfriend. Nathan is possessive and frightening at times. The only bright spark in Rae's life is her part time job at the flower shop, located next door to the coffee house, where she spends time with fabulous haired Leo. When her world is dragged into darkness, it's Rae's love of writing poetry that gives her life sense and meaning. As she finds herself meeting other down and out people through her flower deliveries, Rae has no idea how many lives she's touched... Until it's almost too late. 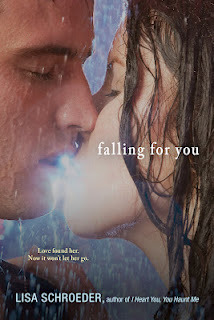 Falling For You surprised me and continued to do so, throughout the book, which isn't necessarily a compliment. The book begins with Rae unconscious in the hospital, and then back dates the story from there. Every few chapters we see another glimpse of what is happening in that hospital room as the story continues. The introduction of Nathan was odd, a little like a cardboard cutout put into a scene as an extra. Without spoiling the entire plot, there isn't any explanation for Nathan's obsession, why he latches onto the first girl he sees or why he falls apart and takes on the role of desperate and dangerous... Then gradually fades into the background, again with no explanation. Nathan clearly has issues, Rae surprisingly realises early in their relationship but yet stays with him, mostly due to her being desperate for someone to love her, and peer pressure. Her close friend constantly dismisses Rae's concerns and it's seen as normal 'guy' behavior. Hell no. She asks to be left alone, that she needs space, that she doesn't want to see him anymore. She describes his behavior as 'creepy', he is stalking her rain, hail or shine, and generally wont take no for an answer. So, so called best friends asks when Rae is going to call him. Rae had people in her life who loved her, but beyond asking her how she was or if she needed to talk about 'It', that was the extent of the help she was offered. A teacher knew that something clearly wasn't right, as did a friend, even a boss / coworker, Rae is a minor, an adult in her life should have intervened before the incident even occurred. The last piece of dialogue heard during her unconscious state was really touching, not tear worthy, but watery eyes are a given. Sadly, it's the only emotion (besides confusion) that I felt while reading this. I didn't hate it, by any means, but it felt unfinished.